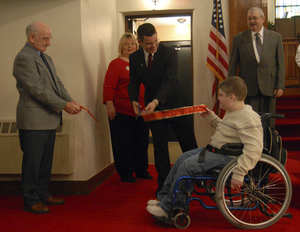 In 2008, the Board of Trustees of Faith United Methodist Church made the commitment to have a handicap elevator installed, which would allow those with disabilities who attend Faith Church complete access to both the sanctuary and the fellowship hall of the church. The Gordon Keen Company of Amanda was the contractor selected for the project. Trustee Gerald Montgomery served as the project coordinator on behalf of the Board of Trustees. The installation of a Prolift commercial full service lift. This lift was specifically built to the specifications necessary for our church and the location of the lift within our church. The work also included the cut through of the existing walls for door openings, (which included through the brick exterior on the northeast corner of the church to install the handicap entrance door) and the removal of the steps that led to the sanctuary and down to the fellowship hall. For those who have never used that entrance or been in the area behind the sanctuary, there were steps that led to the sanctuary or down to the fellowship hall, all of which had to be removed. With the new entrance, the roof over the Seventh Street entrance was extended and new gutters and soffit was installed. The installation of a machine room for the elevator equipment and all electrical work for the elevator was necessary. A new concrete walk from the new lift entrance to the existing sidewalk was also completed. An interior ramp leading from the elevator into the fellowship hall was also installed. Due to the age and condition of the entrance doors on Seventh Street (which were original with the construction of the church), the trustees unanimously agreed to replace the old entrance doors. Wayne Door of Cambridge was selected to complete this work. The new doors are much more energy efficient and aesthetically pleasing. Several of the trustees have provided labor by doing much of the painting of the remodeling project. New carpet has been installed in the new entrance and the entrances leading into the sanctuary and the fellowship hall. King Karpet was contracted to do this work. In addition to all of this work, new exterior and interior lights were installed and a new mail receptacle was placed outside. Total cost of this project was approximately $106,000. Once completed, the Seventh Street entrance will be open for the entire congregation to use, not just those using the chair lift. Without the generous donations, tithes and offerings from the congregation, this project would not have been possible.